This is the talk page for discussing improvements to the World of Warcraft: Cataclysm article. If you're new to the wiki, please take a look at our Talk page guidelines. 14 Cataclysm - Surely an April Fool! Wait, What?! 15 Why Draenei will not get any new classes? 17 What about the people that won't get the expansion? 30 how will noobs cope? 33 The Plaguelands! The Plaguelands! 34 Hmm... Earth Crust Displacement theory? 49 Whats the Download Size of CAT?
" Possible classes at this moment: Mage, Warrior, Death Knight, Rogue, Hunter. " Cool. just noticed that the main page was updated with a super handy link to a matrix . <http://www.worldofwarcraft.com/cataclysm/_images/features/raceclassmatrix_en_US.jpg> —The preceding unsigned comment was added by Yourbuddybill (talk · contr). I think the goblins can't be druids! The worgens can! Maybe the goblin will be: warrior, rogue, warlock, death knight or mage, and the worgen will be: warrior, warlock, druid, death knight or priest. Has anyone else noticed that this sunken city of Vashj'ir is located smack dab in the middle of the Maelstrom, where Nazjatar is supposed to be? Agree, but only once it would have happen, or only the confirmed facts. I meant, do not be over-confident about a zone modification you may have seen in the trailer. Hell it has been moved as a personnal article! No problems with the icons, but this video, they're all the same!! The so called "bastion of antiquity" would be Uldum and Vash'jir. Abyssal plans are not really part of the "antiquity" (antiquity=first living being imo). I hope you don't mind - I moved the image above to the right so that conversations indent properly. "It cannot be stressed enough to players that Blizzard will never ask you for your credit card, password, user name, e-mail address or any other information it already has." Cataclysm - Surely an April Fool! Wait, What?! Am I the only one here who thought Cataclysm was simply an April Fool based on the various promises suggested such as re-design of Azeroth, the new player races, level cap that isn't 90 and the Archaeology secondary skill (Whatever the Hell would you use that for anyway)? Why Draenei will not get any new classes? You are right! The draenei should be rogue! But I also prefer to be druid. Lore my friends, lore. Draenei for a start don't even come from a shamanistic backround, they come from a pure (No rouges), holy (pallas and priests) back round. The only way they managed to give Draenei the shaman was by putting in that broken fella. However I don see why or HOW Blizzard could give TAUREN PALADINS! Seriously, thats just wierd. Yet again, if you kill it and eat it's meat, you won't have to say grace.... or will you? xD. Only kidding nw peeps. The Dodo is not dead!! What about the people that won't get the expansion? Old Azeroth's changes will be server-wide so no account limitation. Solfaris--This article has listed the changes in Kalimdor & the Eastern Kingdoms but I was wondering if they had any changes planned for Northrend as well. To update it so that it has a better quest flow like Outland and Northrend do. While they were changing it, go ahead and make it flight capable, since it has been on their to do lists for a long time. Well that's official since BlizzCon, Barrens are splited in two, North low level and south hi-level. Exactly. If it was just said but there is no solid refrences why is this posted? 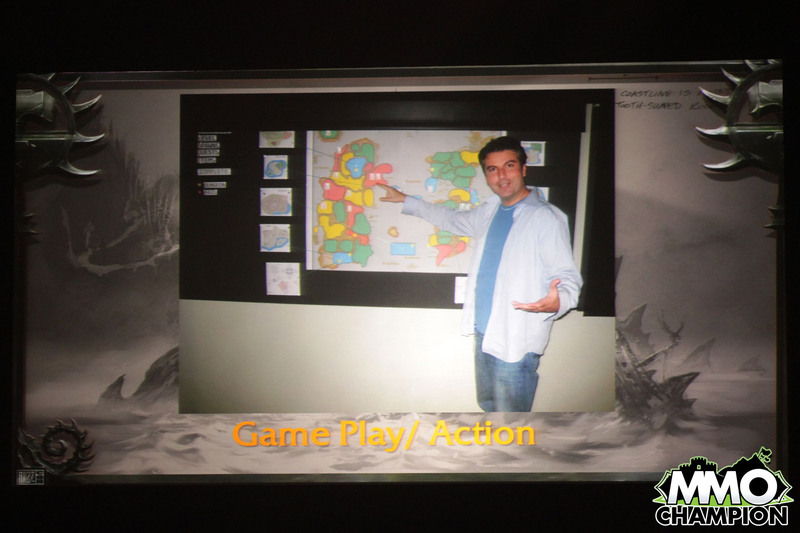 Look at the pictures and maps, Barrens are split in more then one place. But alas you guys feel since you 'heard' it that its correct. When ive seen plenty of people deleting contentent when it lacks a refrence. Might as well delete my account because i refuse to be apart of a hitler dictated group and makes me rethink everything i have read in these pages. If the year is wrong, I bet the period is right: "Santa Claus sells. We buy!" "by next blizzcon people will be complaining about goblin rouges"
a few days after pre-patch:cataclysm! Get your facts straight: the WotLK pre-patch came out on October 14, 1 month before WotLK was released. Furthermore the BC pre-patch came out on December 5, just over 1 month before BC was released. The Cataclysm F&F alpha hasn't been launched (according to the inside source on MMO-Champion) and it's unlikely that the beta will be released soon. I seriously doubt that StarCraft II will be released in June since a release date hasn't been announced. ok you were right about the pre-patch thing.i also have an update sense blizzard announced that blizzcon will actully be held in october so instead im thinking something like this. may:3.3.5 and maybe a cataclysm beta. september:cataclysm or cataclysm may come in early october. It's obviously for next Wednesday considering Operation: Gnomeregan lastest preview. I don't think Cataclysm is going to be released in 2010. There is just way too much that needs proper beta testing. Uldum and Twilight Highlights still haven't been released to beta. Level 85 raid content isn't in beta yet, and the same is true with Archaeology and Mastery. The talent overhaul needs more work and balancing. The streaming launcher NEEDS months of beta to ensure it meets Blizzard strict standards. This thing is HUGE. It's not like a new sub-zone. This is how Blizzard is going to deliver data to players. And the bugs: they stretch up to the heavens! There are pages after pages of them on all of the beta forums with more being discovered virtually every minute. It's also a sad sign that the bug tracker is also bugged. I can't even imagine Blizzard pushing this out the door until early next year. this needs to be tested until at least Q1 2011. A Summer 2011 launch should resolve most, if not, ALL bugs. If they push this game out the door this year it will be the first game that doesn't live up to Blizzard's reputation of releasing top-quality products.—The preceding unsigned comment was added by Korval (talk · contr). Rare are the players saying "glory to vanilla" and who don't buy any expansion pack anyway. Well I can see Blizzard at some time in the future "merging" Classic with older expansions, in terms of need for purchase. You just purchase WoW, and have Classic, BC (and WotLK) already. Does this mean then that "Fall of the Lich King" was exactly that? "Bye bye Arthas mate, I knew you were only pretending to be so strong"..? I mean they said Fall of the Lich King will be the last major patch before Cataclysm and I cant see they slipping in the LK's demise in a reset. So what gives? —The preceding unsigned comment was added by Lyco (talk · contr). The article would have answered your question, if you only bothered to read it : World of Warcraft: Cataclysm - Zones affected by the Cataclysm. Except this point, Cataclysm will most likely be like BC and WotLK : if you don't install it, you cannot access new races, professions and zones. The side effects of Saronite mining clearly explain that no "mortal" structure could use saronite, only the Scourge is not driven mad upon prolonged contact. There is a quest call An Injured Colleague. It takes you to elder rise where you see a Tauren in robes wielding a staff and a Tauren kneeling with a large sword and armor. If you hang around, they will begin one of two dialogues, readeable at Aponi Brightmane#Quotes and Tahu Sagewind#Quotes. What would you do if you came to realize your instructor may not know as much as you thought, and that you may have found a better path?" But what is your point? Where is the little something we don't already know? So what will happen to the Plaguelands? I saw the chart on the article saying the levels would be changed but, what does that mean for the content? Will everything just be de-leveled a little, or will they drastically change it? What about Araj, Andorhal, and the Plague Cauldrons? How about Scholomance and Stratholme? Or the amazing quests like [60G] In Dreams and  The Battle of Darrowshire? Hmm... Earth Crust Displacement theory? This is not a forum, dicuss the topic or begone. Changes only deserve a Cataclysm section for now, as the Cataclysm has not yet happenned. But be bold, copy/paste articles in your namespace and start formating them for the D-day. Does someone else recognize faceless ones in the top left corner? beta has no nda so when the beta comes out will you post information on it? —The preceding unsigned comment was added by Almasa (talk · contr). I have a link to a page that says the nda will be lifted on sunday! Google it like you mean it! Since horde took ashenvale so no more wsg?—The preceding unsigned comment was added by Foxer123 (talk · contr). New auto-quest technology introduced in Cataclsym will allow players to complete quests and take follow up quests in the field without having to return to quest givers. New quests in a chain will simply pop up once you've completed the quest criteria of an earlier quest. Cataclysm is launching with three raids, not the four previously announced. Given the latest information revealed on the raids, this would indicate that Firelands has been dropped as a launch raid. 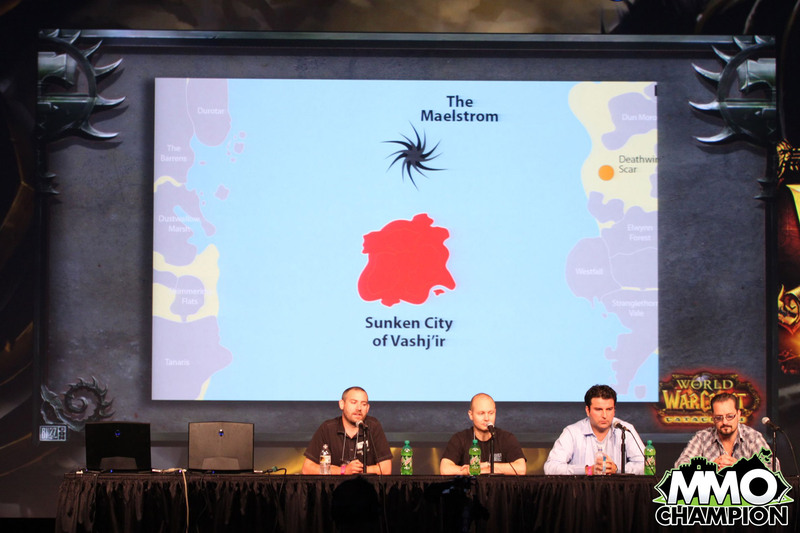 We choosed to move Sunken City of Vashj'ir to Vashj'ir because "this is how it appears in beta, Blizz's plan must have changed". We need to choose one or the other, not both when it favor someone/us. But this doesn't exactly say anything specific about level ranges being temporary and changeable. Could you also provide a source from Blizzard via their forums, Q&A or something? Look, if no one is going to do me the courtesy of posting a single source verifying the removal of level ranges because Blizzard says, "these zones are going to sustain heavy changes" then I don't consider the removal a valid one. Until someone can provide evidence to the contrary I think the level range information should remain as-is. If we're going to make these sorts of claims and not provide evidence, then by extension any information related to Kelp Forest, Shimmering Expanse and Abyssal Depths should be removed. This would also include information such as level requirements for quests in Vashj’ir. Again someone provide a Blizzard source showing where they claim the zones are "are going to sustain heavy changes" specific to level ranges. We post and edit, based on what we see in Beta. Why would this particular point escape the rule? Wrong A'noob. We do not post everything as it is in Beta as it's work in progress and there are many temporary work arounds and solutions in place that will never be used outside of beta. Hey all, I'm having some trouble with the patch mirrors; I have donwloaded the 3 seperate parts and have copied them into the Updates folder, but I think I might have done this incorrectly as I'm still getting the Launcher pop up trying to download the content. The problem is, the router blocks the blizzard downloader so I cant do it that way. If anyone can shed any light on this, it would be much appreciated. Blizzard has notes on this, which I believe are duplicated here. If you have access to the router's settings, you can add the suggested ports so that the Downloader will be able to get through. On my Linksys routers, it's under "Applications and Gaming," and there are pages for single ports and for ranges, which makes it a little easier. There's also (on many routers' controls) an option for UPnP, which communicates the applications' settings to the router; but I don't know if this is still relevant. (In any event, I have it turned on, haven't set any forwarded ports, and it's working under Windows 7.) One thing I always forget to do is to launch the Launcher or Downloader with "Administrator" access so that it can make changes to the disk without exiting with a strange error message-- one of the charms of Windows that Mac people don't have to put up with. First off, UAC isn't a "problem" - it's like su on Linux. The only difference is that in most cases Windows can automatically detect when something may need escalation and request it there. In fact, it's optimal to set a complex Administrator password and live with typing it in every time you need escalation - it prevents people who have physical access to your computer from messing around with it. I'm sure this information is out there, but a lot of it is inference. It'd be helpful to have a section on "what to do before the Cataclysm:" i.e., the Achievements that will from that point on be Feats of Strength, the factions that will disappear, etc. There are a number of lists scattered across the Web of this variety, but most of them amount to a more personal "what I want to do before Cataclysm" topic and not a more general "what will be impossible to do after Cataclysm is released." Loremaster and [Universal Explorer]. While the Exploration Achievements page implies that these will be around, getting quests that may disappear or logging regions that will be no more can help gain the meta-achievements. Pets that may disappear, especially rare pets, both vanity pets and hunters' pets. The Sprite Darter is a good example. The Classic Dungeons and Raid Achievements. Get Exalted with the Zandalar tribe. Getting Dartol’s Rod of Transformation. Whats the Download Size of CAT? This page was last edited on 11 September 2018, at 14:27.